China food sector’s revenue in the third quarter of 2018 slumped by 27.5% y/y to RMB 406.1bn, mainly due to declined prices of meat and refined edible vegetable oil. Meat prices in the first nine months of 2018 slipped by 5.3% y/y because of a decline in pork prices. In the first three quarters of 2018, the price of pork dropped by 10.3% y/y due to oversupply in the segment. Refined edible vegetable oil price in Q1-Q3 2018 was down by 0.9% y/y. 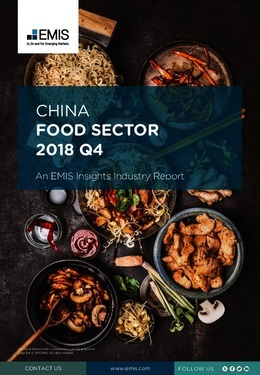 Total profit of the food sector in Q3 2018 slid by 2.6% y/y to RMB 33.1bn due to decreased sales and prices. This report provides a complete and detailed analysis of the food manufacturing sector for China. EMIS Insights presents in-depth business intelligence in a standard format across countries and regions, providing a balanced mix between analysis and data. Build a clear picture of trends and issues for sub-sectors (e.g. baked food, candies, convenience food, dairy products, canned food, and retail sales).